Heather Garriock. Photo: Supplied by Canberra United Football Club. Canberra United looks set to miss out on finals football for the second year in a row as the club’s finals chances hang on by a thread. With just three games left till their season draws to a close, United are languishing in the seventh spot on the ladder, five points off fourth place. Canberra remains a mathematical chance to play finals if they win their final three games, which will take them to 18 competition points but United will have to win against Adelaide, Victory and Brisbane, three of the top four teams. Last season was the club’s worst season, failing to make finals for the first time in five years after the club managed a meagre 16 points throughout the 12 games last season. United need at least seven points from their final three games to avoid setting a new unwanted record for the club. It has been a tumultuous two seasons for head coach Heather Garriock, who is desperate to lead the club out of the wilderness and back to a championship force. For a club that is used to winning and making finals, winning just seven of the past 21 games is well below par. So where has it gone wrong for Canberra United? Garriock is a more than qualified coach, having spent three seasons coaching the Sydney University women’s football team, fostering one of the top female football programs in the country while achieving enormous success in the NSW Women’s NPL 1. 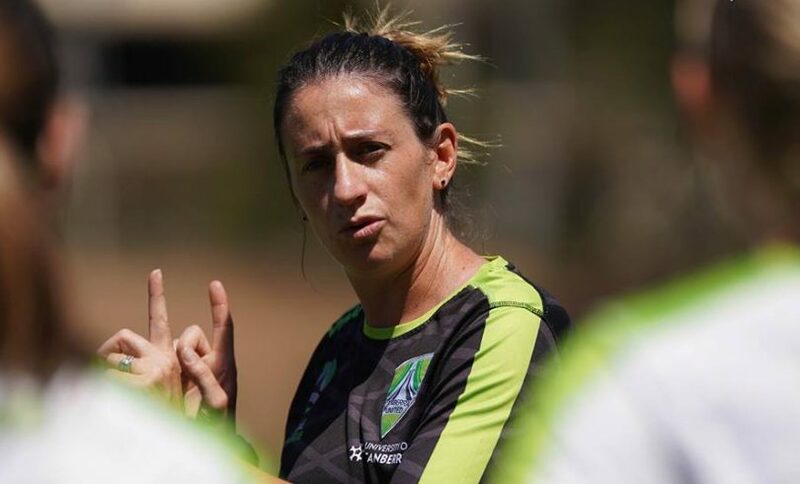 Vastly qualified in all areas of football, Garriock’s coaching resume also includes roles as an assistant coach for both the Young Matildas and the Matildas national team, working with elite players at the highest level of the game. Injuries, international call-ups and players contracts ending mid-season have ravaged United this season. A settled and consistent squad is a must in the short 12-game season, but United’s squad has been far from consistent. The fact that Ashley Sykes came out of retirement to play this season is a testament to a disrupted side. United has played the majority of their season without one of their star defenders, Natasha Prior, who suffered a severe concussion and was stretchered from the field after a nasty clash during United’s round five win over Sydney FC. United has also played games without captain and Scotland international Rachel Corsie and the dynamic South African star Refiloe Jane along with the debacle surrounding the contracts of Denise O’Sullivan, Maria Jose Rojas and Paige Nielsen. Garriock is the first to admit the side is not performing and is adamant she can turn their form around. While fans may be growing restless and speculation may be swirling, Garriock built her 130-game international career as a ferocious competitor and is adamant her team will start producing results. “I have full belief in the playing group and I’m sure they have full belief in me,” she told gathered media on Wednesday morning (9 January). “Just because results don’t fall our way, you don’t just throw the towel in. We at Canberra United know we’re a family and we’re going to continue to try and get results,” she said this week. “We just need to be patient, I’ve built my team this season and I think I’ve built a really quality team and I still believe that and I’ll still say that right until the end of the season. Canberra United vs Adelaide United at McKellar Park, Sunday 4 pm. Tags adelaide united canberra united Heather Garriock McKellar Park W-League.